Aaron is a friend of our congregation, a man in maybe his 30’s who is experiencing addiction, homelessness, and lives with mental health issues. He shows up for worship now and then; lately, on high holy days. I’m beginning to wonder if he isn’t a messenger from God. On Sunday the choir led most of worship. We (I sang with them) presented portions of a rather extraordinary work entitled “Calling All Dawns” by Christopher Tin. Twelve songs, incorporating sacred texts and poetry from many cultures, that describe the cycle of day, night, dawn; life, death, and rebirth. We sang seven of the songs, in Swahili, Japanese, Chinese, Polish, Hebrew, Farsi, and Maori. I gave a short reflection, and wrangled the doctrine of the Trinity with the Bantu word and African ideal of ubuntu – “I am because we are.” I think it worked. Maybe not. But it was my hope to weave together the context of the music with Trinity Sunday with our call to be community to each other and the world. Oh, how we preachers stretch sometimes! So after the service there was much hugging and complimenting and the usual handshaking. As things started to clear out, I saw Aaron sitting by himself in the back pew in the transept. I sat with him for a minute or two. In the last year I have learned that two things can ground the most ethereal, theological, grand worship: a bald child who is battling cancer and a homeless man who comes to worship because he craves community. Maybe God sent Aaron to us this morning to remind us that as much as we sing about following the way and praising God and living out peace, we must never forget that it begins in the pews and on the sidewalks that surround the church. I wish I knew how to help Aaron. I know how to give him cash and food; I know how to pay for a motel room for him. I also know he would probably not be accepted into a shelter because of his addictions, and I know shelter spaces are too few in our city. I wish we had better mental health practioners who worked with the homeless; again, the few we have are overloaded. So for now, I do what is inadequate: I welcome him in church. I call him by name. I recognize him not only as a child of God, but as a messenger of God. And the message is that we have work to do. Does a prayer have staying power? Does a litany change anything, or anyone? Almost every week I write liturgy for the bulletin, usually a call to worship and a prayer of confession, maybe communion liturgy. I spend a fair amount of time on it (and make it available elsewhere on this blog). I enjoy the process; it adds the sense of poetry to my usual to-do list. Some of the stuff I write isn’t half-bad, if I do say so myself. But occasionally the thought comes: does this make a difference? 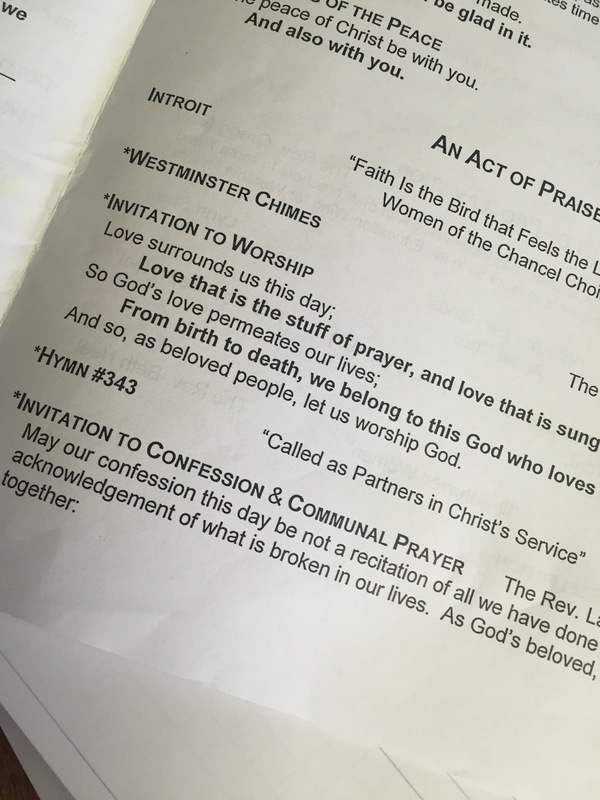 People get one shot at their part in the call to worship, and then we’re on to the opening hymn. Did a word catch them? Did a phrase redirect their thoughts? Do the words of confession that I put together resonate at all with at least one person in the pews? Lately I’ve decided that the liturgy – or at least the liturgy in our Presbyterian worship – is momentary. The grass withers, and the liturgy fades, but the word of the Lord will stand forever. And maybe that’s not bad. A petite-four is a momentary thing; so is a sidewalk drawing. Which is not to say those things aren’t beautiful, brief though they are. If everything were eternal, we’d be overloaded. Maybe liturgy is like KonMari for worship – something non-essential that is done with once uttered. I think I’m okay with that. But I’ll write on, not for eternity, but for the moment.